BALTIMORE, March 10, 2016 – This month, Pride of Baltimore II, America’s Star-Spangled Ambassador, celebrates the founding of Maryland with unique events in Baltimore and Historic St. Mary’s City. Members of the media are invited to attend these events; please RSVP by emailing Laura Rodini at laura@pride2.org. On Friday, March 18, 2016, at 9:30 am, Pride II launches her sailing season and takes part in a special Maryland Day-related ceremony at Fort McHenry National Monument and Historic Shrine. This event is free and open to the public. 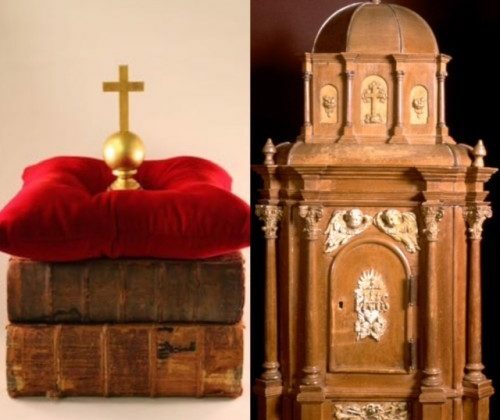 On hand will be the Archbishop of Baltimore, William Lori, as well as representatives from the Society of Colonial Wars in the State of Maryland, which is responsible for the creation of a wooden cross fashioned from the roots of a 600-year-old tulip poplar. The Liberty Tree cross, as it is known, will receive a special blessing from Archbishop Lori and then be placed aboard Pride II, where it will be transported from Baltimore to Historic St. Mary’s City in Southern Maryland. The journey is expected to take 17 hours. As reported in The Baltimore Sun, the first Liberty Tree cross was presented to Pope Francis in 2015. 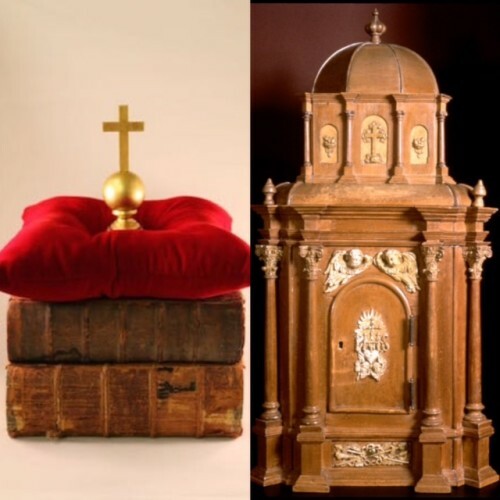 The second cross was given to Prince Charles – and the third and final cross will be presented to St. Mary’s Chapel at Historic St. Mary’s City, where it will reside at the top of the dome for the reconstructed Carroll Family tabernacle that scholars believe was used at the chapel in the 17th century. “The rich symbolism of a cross made from the roots of Maryland’s Liberty Tree completing the altar at the place the first roots of Liberty of Conscience were planted in the New World is truly wonderful!” says Historic St. Mary’s City Director of Research Dr. Henry Miller. Pride II will also take part in Maryland Day commemorative events at Historic St. Mary’s City beginning at 1:00pm on Saturday, March 19, 2016. The event will kick-off with a procession of the Liberty Tree cross at 12:45pm aboard Pride II, and end at St. Mary’s Chapel. Following the ceremony, guests are invited to the opening of a special exhibit within the chapel. This exhibit contains the three lead coffins that held the remains of Maryland’s founding family: Philip Calvert, his wife, Ann Wolsey Calvert, and an infant. The coffins will be visible through a glass floor so that visitors can see this extremely rare example of early Maryland history. Representatives from the Society of The Ark and The Dove will be on-hand as well as descendants of the Calvert family. Two key founding documents of Maryland will also be on display: Father Andrew White’s account of the voyage of the Ark and Dove in 1634 and a letter written by the first governor, Leonard Calvert. This marks the first time these documents have returned to St. Mary’s City since they were dispatched to England on the Ark in 1634. Maryland Historical Society Chief Curator, Alexandra Deutsch, will provide remarks on these documents. There will also be a Presentation of the Flags from fourth grade students from each county in Maryland, beginning with the newest and proceeding to the oldest county. Several of the state’s leading politicians are expected to attend. All events March 19 will be free and open to the public. This includes the procession and dock tours aboard Pride II and her maritime ancestor, the Maryland Dove. It also includes the unveiling of the exhibit within the chapel. For more information and directions to Historic St. Mary’s City, visit the Historic St. Mary’s City homepage. For nearly four decades, Pride of Baltimore and Pride of Baltimore II have represented the people of Maryland in ports throughout the world, spreading a positive message and extending the hand of friendship globally. Since her commissioning in 1988, Pride II has traveled more than 250,000 nautical miles and visited 40 countries in 200 ports. Pride II has become one of the most well-known U.S. sailing vessels in the world, capturing the imagination of millions of people.